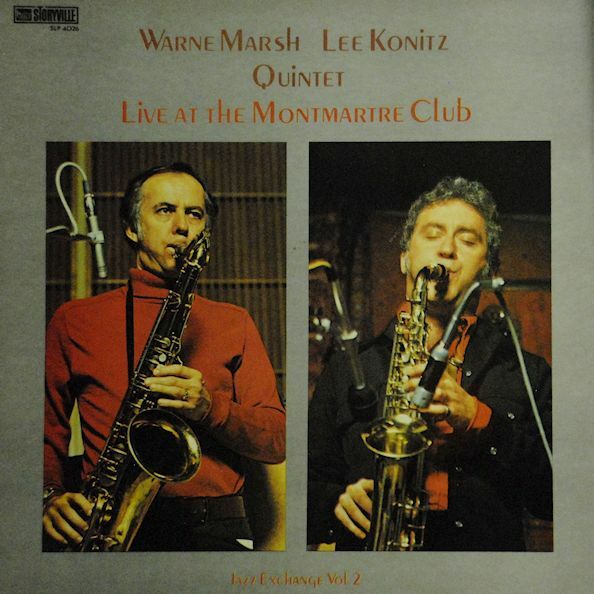 This is music from a show that Warne Marsh and Lee Konitz, two very old school jazz saxophonists, gave at the legendary “Jazzhause” Montnartre Club in Copenhagen, Denmark on December 27, 1975. I know this because of the liner notes which are very complete. I know that this is not the complete show because the whole set list is online … as are all of Warne Marsh’s set lists and recordings (most of the shows, rehearsals, radio shows were recorded from what I can see) from 1942 (o3 1943 – they aren’t sure) to 1987. I’m really impressed with that. There are set lists of his rehearsals in Bergen, Norway that exist as private recordings. I am impressed by the details and the pedantry of these jazz aficionados. These are details and history that the artist himself had forgotten. I’m not a big jazz fan, certainly not to the extent of the person or persons who put this discography together, but listening to this music and researching the travels and recordings of Warne Marsh really hit the spot. This album will definitely be on my frequent rotation shelf.